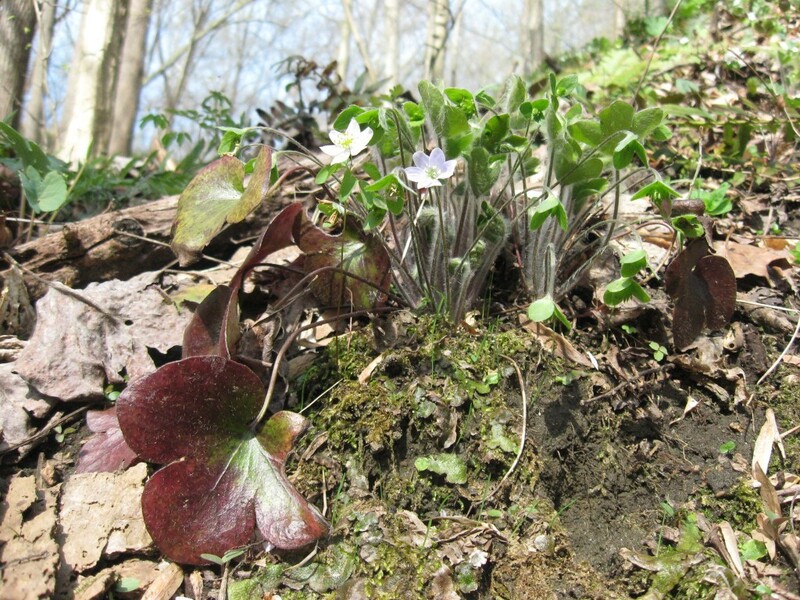 There is a small hillside in our garden that gets plenty of Spring sunlight and is covered in Trout Lilies, Spring Beauty, Bluebells, Dutchmans Breeches, Mayapples and Trilliums. Bloodroot blooms white and bright in the early Spring. We call this section of the front yard Shenks Ferry. 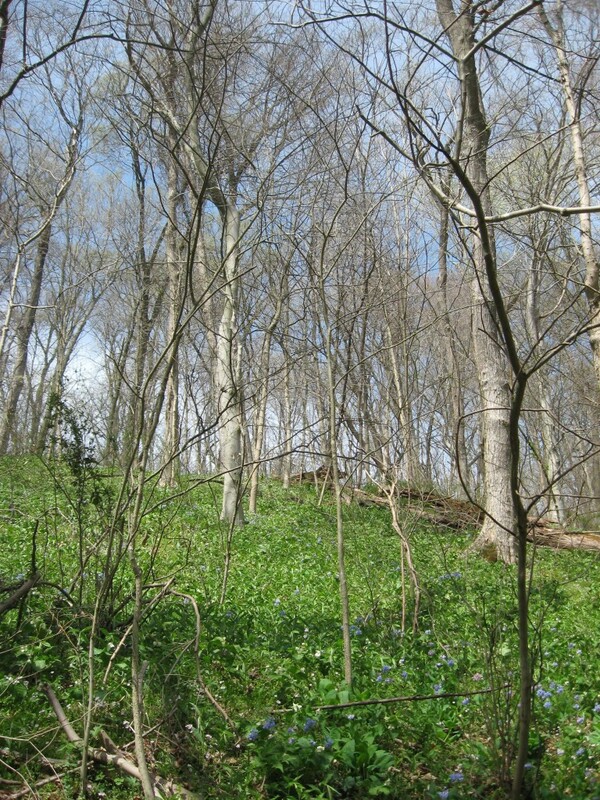 Our Bluebells are in full bloom, often bluer than the sky, the colors are so rich, especially in the evening. 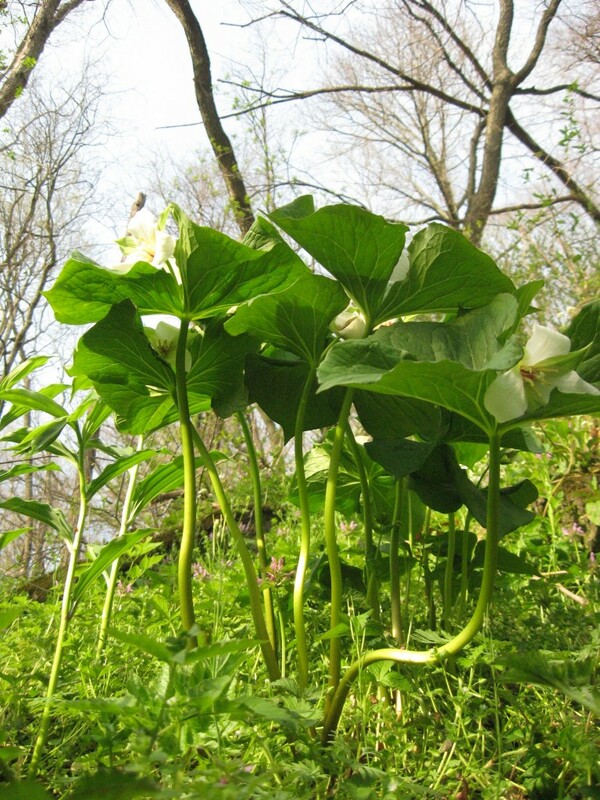 The patch is thick and the luminescent blue is so striking against the white flowers of our Trillium erectum var. Album, which we purchased at our local Native Plant Nursery , Redbud Nursery. 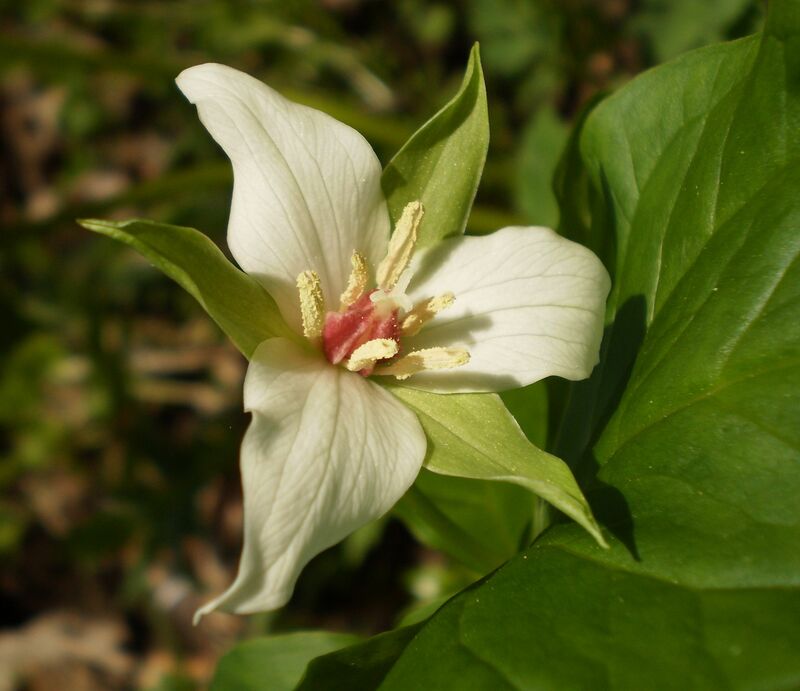 Only guessing here, but the seed stock for this particular trillium was most likely collected with permission at or near Shenks Ferry Wildflower Preserve, being that the white flowered version of this usually red Trillium is found primarily in the vicinity of or at this specific site. Every year our garden bluebells grow in size and are re-seeding themselves, making our garden look more and more like Shenks Ferry Wildflower Preserve . 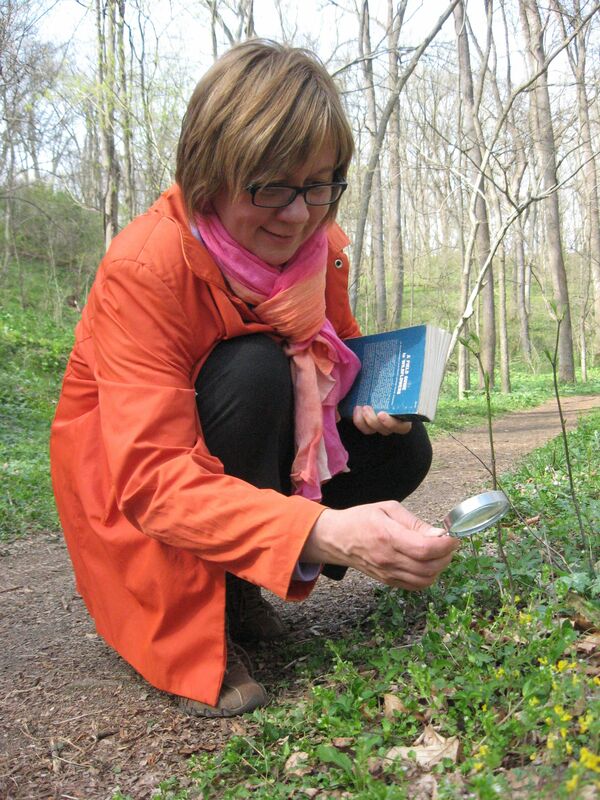 The magnifying glass can create a whole new dimension to exploring the plants in our garden! Our garden has inviting paths, that we can use without stepping on the plants. 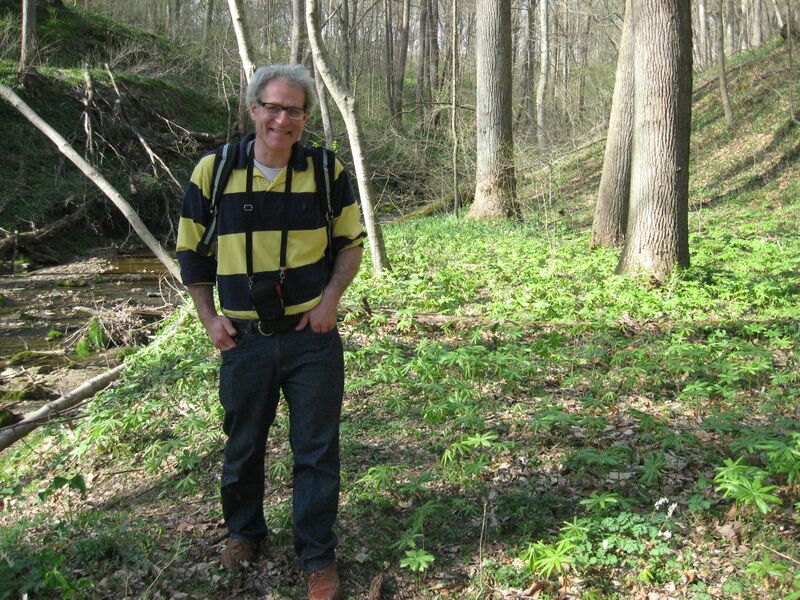 Being that native plants are losing so much habitat to development and exotic-plant dominated landscaping, as well as the invasive exotics that are running rampant through what is left of our natural lands and remnants, stepping on a native plant in Shenks Ferry is to be avoided at all costs. 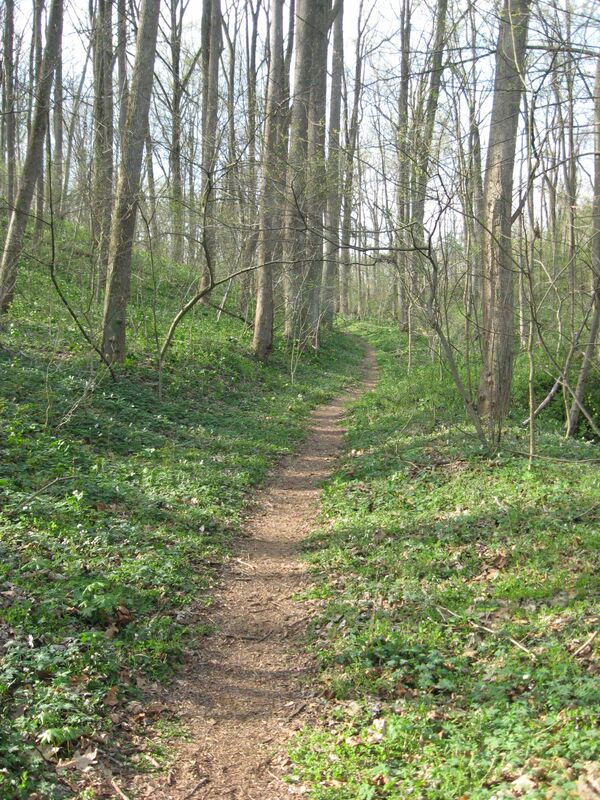 So we practice not stepping on native plants in our garden, using our narrow but inviting paths. Our reward for not stepping off the paths and crushing the plants is we get Trilliums growing right up next to the path that will one day grow to be 18 inches high and almost a foot in diameter! 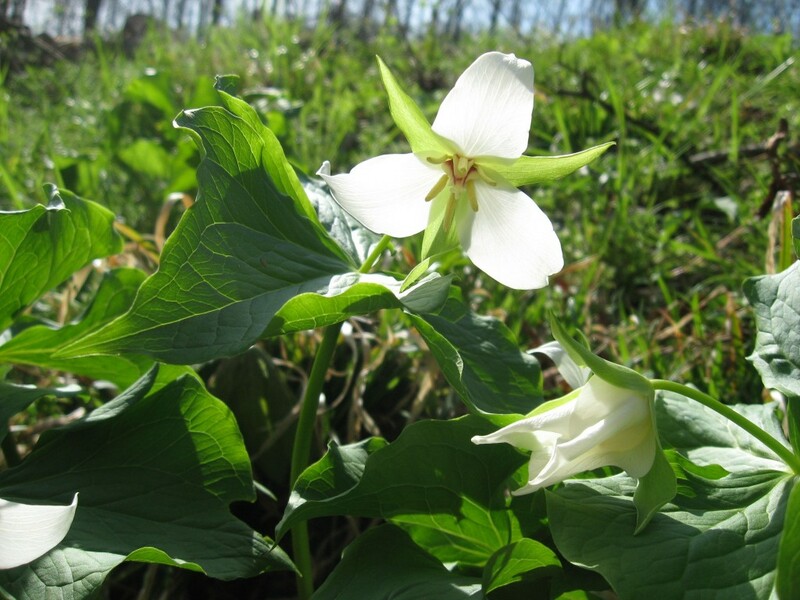 The Trillium Erectum var Album growing in our garden will one day reach the soaring heights and broad span of this glorious specimen at Shenks Ferry Wildflower Preserve! 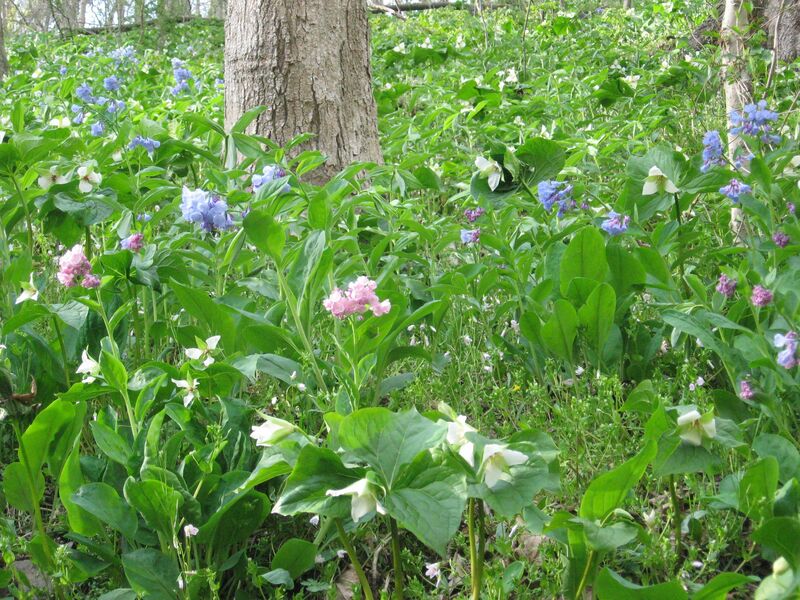 In our Philadelphia rowhouse yard, the Trilliums and Bluebells grow together, just like at Shenks Ferry. In fact, Shenks Ferry has been instructional in our garden construction. We have ground up our leaves in the fall and created a thick layer of leaf compost in our garden to match the soil conditions of Shenks Ferry as best as possible. 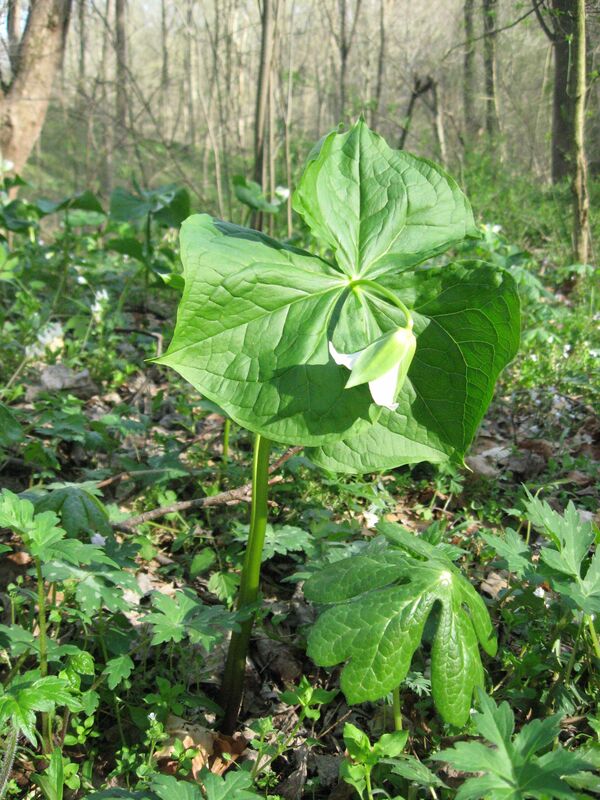 We pay close attention to plant associations so we may plant our Trilliums, Bluebells, Mayapples, Dutchman’s Breeches, Maidenhair Ferns and Christmas Ferns in a naturalistic way. Even more inspiring for us was the one sunny Spring morning last year when our garden looked like a miniature Shenks Ferry Wildflower preserve! Thats when we named the little hillside alongside the front patio “Shenks Ferry”. 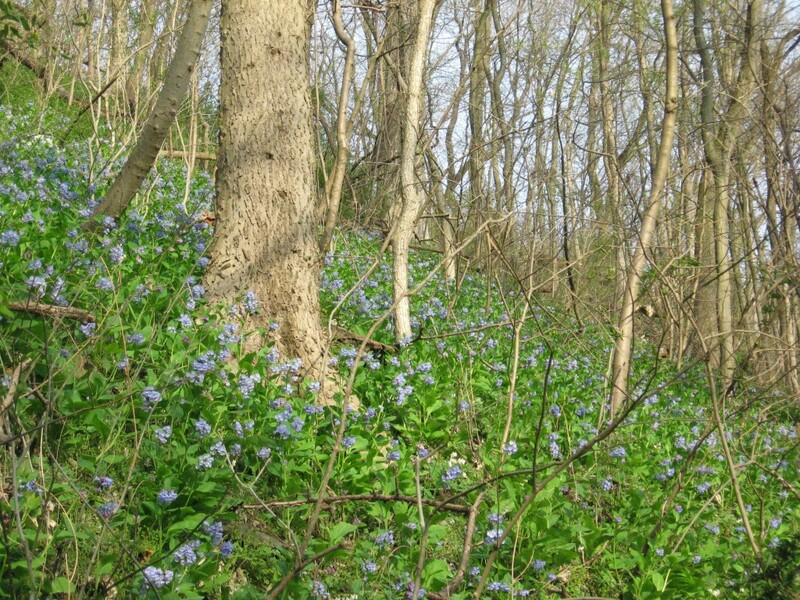 Even the Spring sky had that bright clear blue color and the ground with that fresh bright green of Spring Ephemeral wildflowers! We had achieved the goal of creating in miniature what we find the most beautiful in our regional natural environment in just a few years. 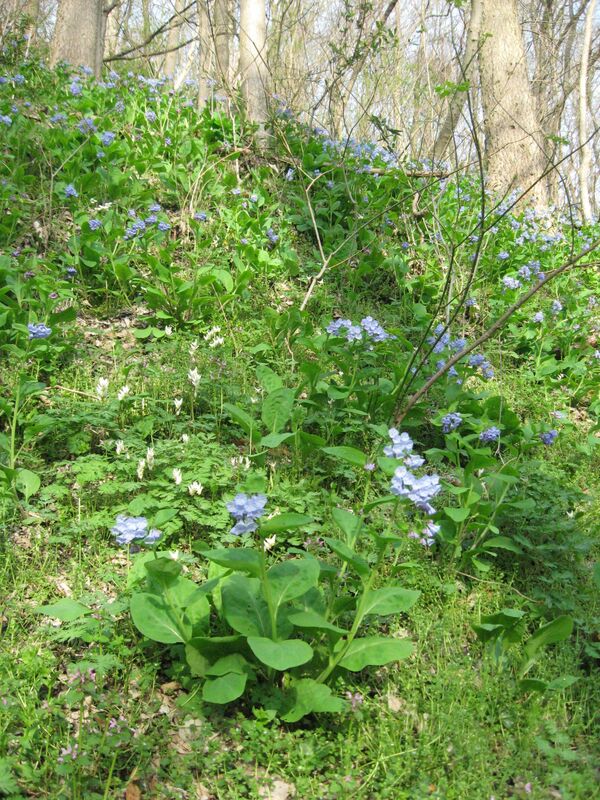 When we started the native plant woodland garden, it was a monoculture of the invasives Japanese Pachysandra, English Ivy, Vinca vine and a few daffodils, all of this in the shade of a mature Pin Oak and Sugar Maple, both native forest trees. There was a Japanese Maple in the middle of the yard, which we gave away after we ripped out, bagged up and trashed all of the invasives and brought in a few truckloads of leaf compost from The City Of Philadelphia’s Fairmount Park Recycling center. The yard was a ‘pass’ and respectable from the standards of a city yard before hand, but to us it was completely unacceptable, uninspiring, boring, and useless to the local ecology. 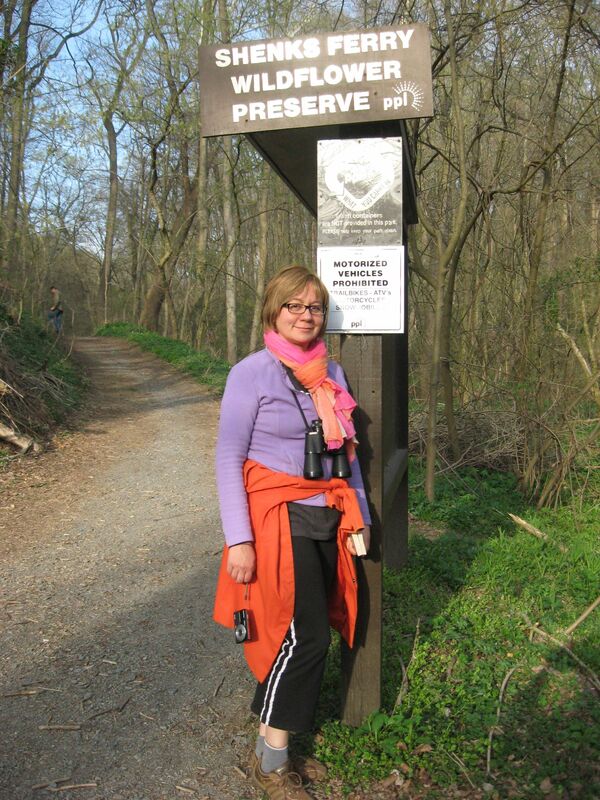 Robins would hop up and down in the adjacent Morris Park, but not in the yard. 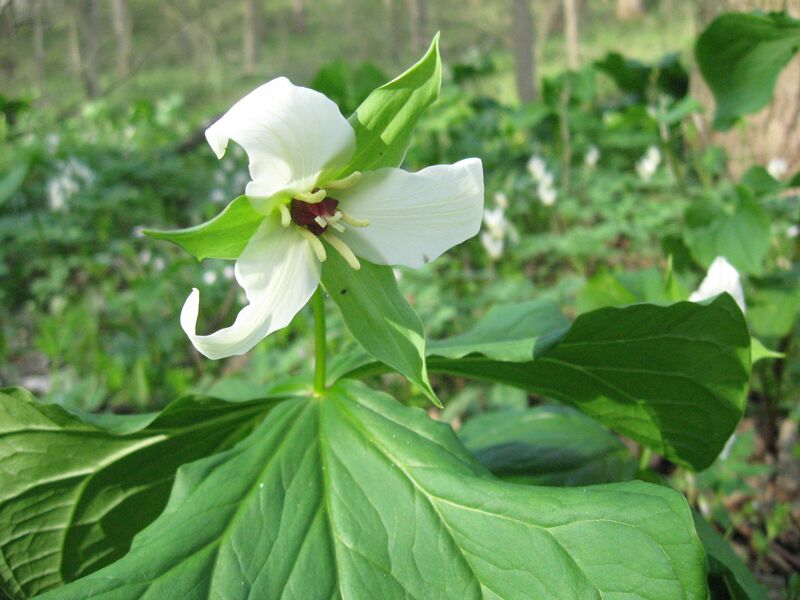 Now we have many Trilliums growing in the our yard, and many of them flower every year. We also have a growing Trout Lily patch, but no flowering ones yet, its only been three years. 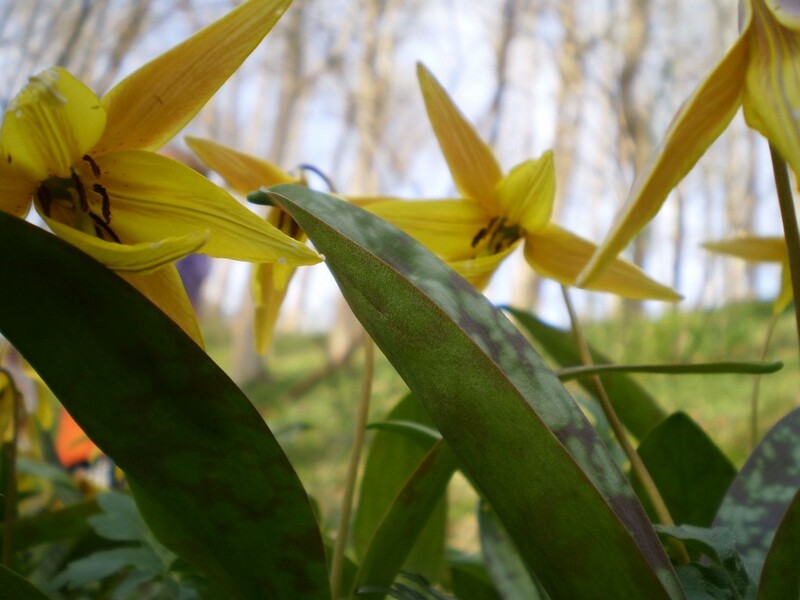 To get a flowering Trout Lily takes years and years of growing. 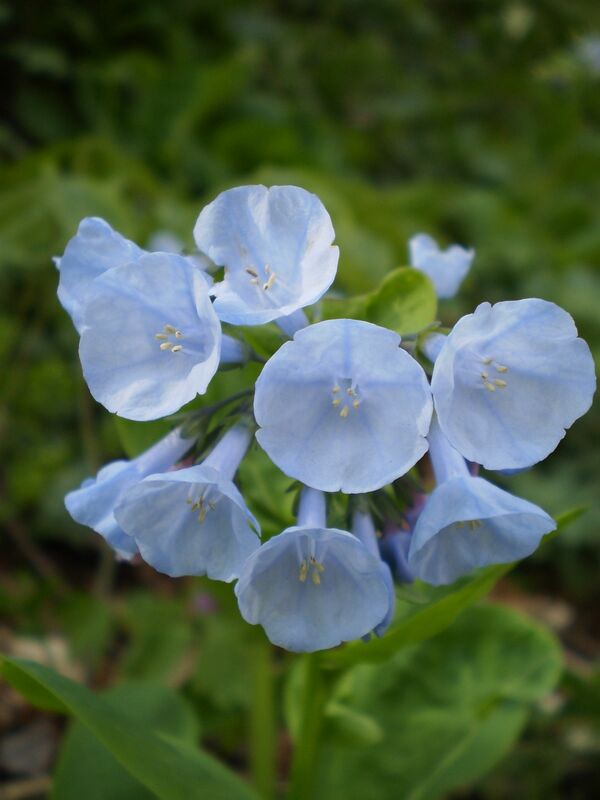 The Bluebells are fast growers and generous bloomers and make a great garden patch! 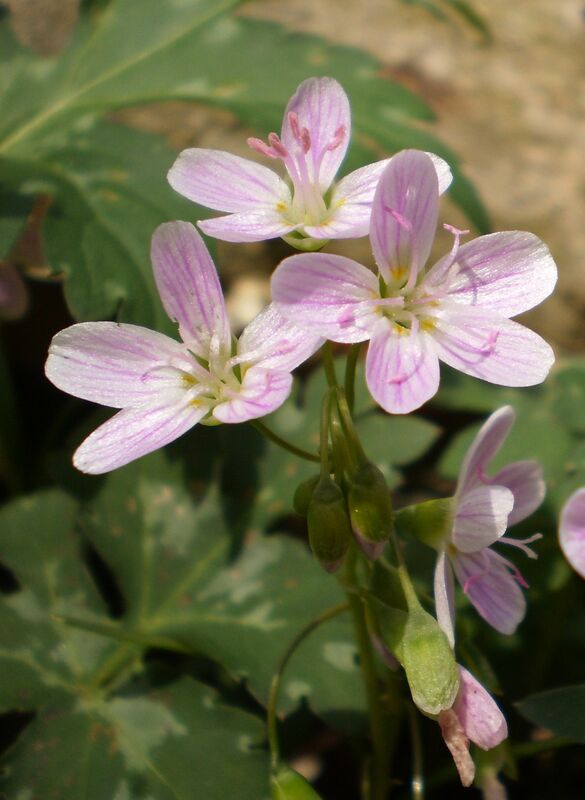 Above, the Spring Beauty blooms all Spring in our yard and creates a great border close to the paths. While our yard will never come close to the natural beauty of Shenks Ferry, we have managed to recreate a satisfying miniature replica of it in our inspired efforts of cultivation. The replica has some of the same plants, facing the sun in the same directions, protected, not from cliffs or steep hillsides, but from stone rowhouses, but protected nonetheless. When we drive the 78 miles from Philadelphia to Shenks Ferry, we see the landscapes that lack what it is we are searching for and trying to create: highways and developments lacking mature trees; invasive vegetation entangling our views for miles, the outright mis-management of land in general, from broad lawns to vast expanses of pavements to invasive weeds, the trip is exhausting to witness from our perspective. Now, people are visiting Shenks Ferry in crowds, seeking the beauty of a place left alone for the most part since 1906, when there was a dynamite factory on the site that exploded, killing 11 people. Shenks Ferry is an inspiration for us, as a place of beauty and a glimpse of the natural world of our region, just to appreciate as it is and to aspire to in our own habitats. 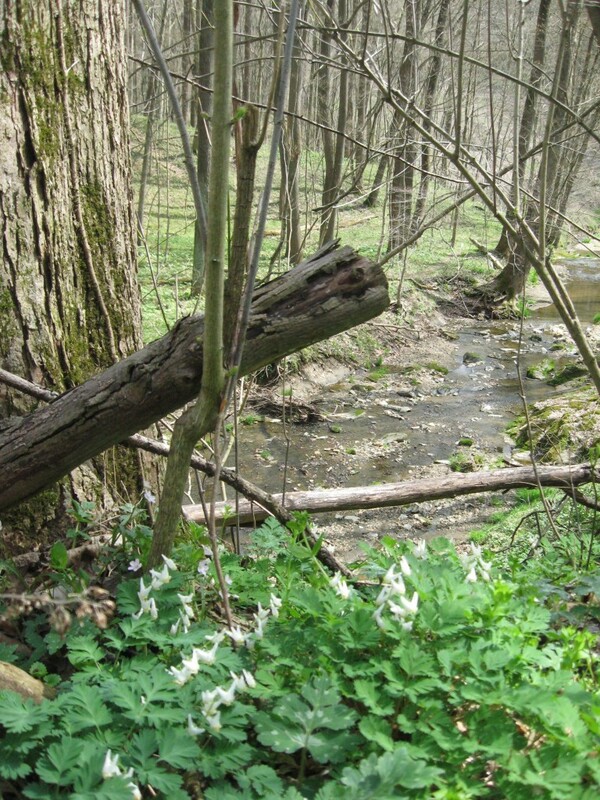 When we garden ornamentally, this regional habitat, ecosystem, forest, woodland wildflower forest-scape and natural ravine is the essence of what we aspire to. Shenks Ferry gives us that Sense-of -Place. Every morning, in the Springtime, Robins now hop up and down in our yard. 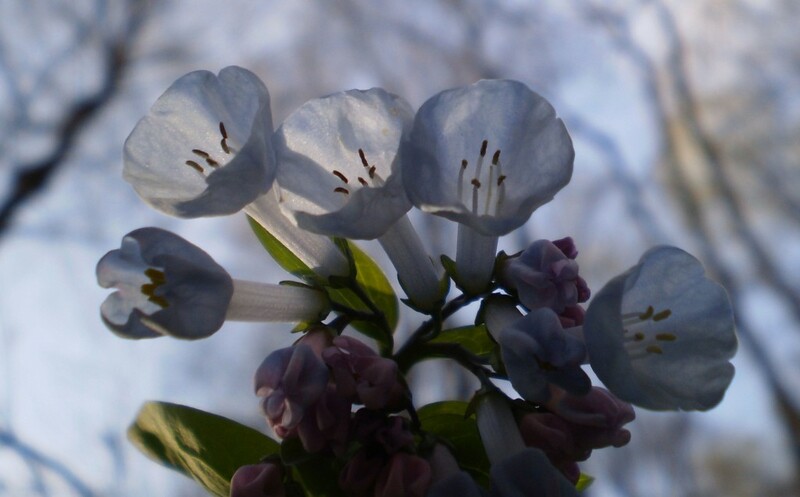 This one patch blooms with robust white flowers shaped elegantly and growing larger each day of their blooming. We captured the flowers opening on a warm, sunny afternoon in early April,2013, with this freshly minted Time-lapse video captured on the I-phone 5 using the O-Snap app. 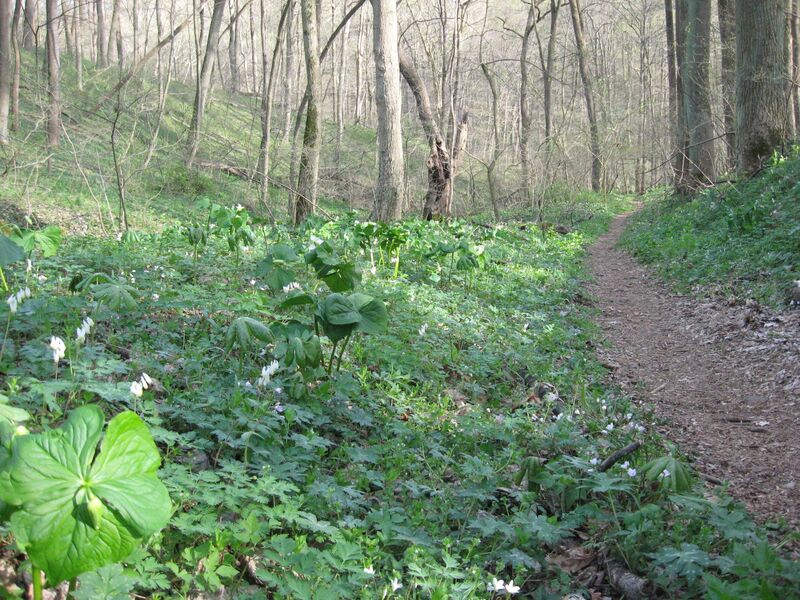 Our favorite patch of Bloodroot Blooms before your eyes! Watch as the flowers bloom into spring! Click the link below and enjoy the one minute video!